Konrad Heilig and Gustav Tiedemann, two officers who joined the Baden Revolution(s) of 1848-1849, were shot on this date in 1849. In southwest Germany’s edition of the revolutionary wave that swept Europe in 1848, Baden’s radical democrats attempted to topple the Grand Duchy of Baden in hopes of uniting with a (still aspirational) greater Germany. Two separate risings were easily defeated in 1848. 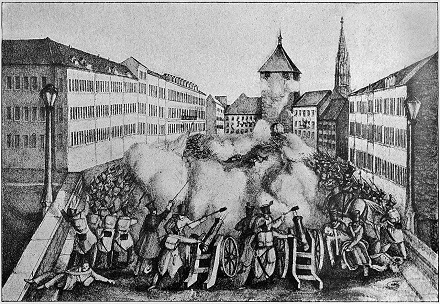 German Confederation troops storm Republicans in Freiburg in April 1848. Baden revolutionaries’ last gasp came in May-June 1849; its progress in detail is explored in a public domain volume, An Account of the Final Struggle, in Baden, for the Maintenance of Germany’s First National Representative Government. Remnants of the left in Baden, exiles from the last go-rounds, and sympathetic soldiers who mutinied at the fortress of Karlsruhe and Ratstatt declared yet another abortive republic. Although the disturbance briefly forced Grand Duke Leopold to flee, other German states allied with Leopold’s exiled government to crush the rebellion. Revolutionary Baden had no chance in a test of arms against Prussia, which defeated the rebellion at Waghausel, then reduced the holdout fortress of Ratstatt. In all, 19 were shot there as rebels between August and October of 1849. In the year 1873, friends and companions-in-arms of the dead asked permission to erect a gravestone common to all those interred there; the Baden government offered no objection but Prussia stepped in with its veto, and the burial-place is still unmarked, although visited yearly by pilgrims from all parts of the world.